Help Biene Amelion satisfy a debt by retrieving an heirloom. Talk to Burz gro-Khash in Cheydinhal to receive this contract. Visit Biene Amelion in Water's Edge to discuss her dilemma. Decide on the path of your adventure and provide Biene with the means to satisfy her debt. Return to Burz gro-Khash to receive your reward and further instructions. Visit Burz gro-Khash in Cheydinhal after completing Drunk and Disorderly for Modryn Oreyn. Burz has a contract for you from Biene Amelion in Water's Edge, a settlement north of Leyawiin on the western shore of the Lower Niben. Find Biene in her house or around the small settlement. It appears she has inherited a debt (1000 gold) from her father, who was dragged from the house in relation to the debt. Biene wants you to retrieve her grandfather's ceremonial sword and cuirass - which are respectively enchanted with Frost Damage and Frost Shield - from the family tomb so she can sell them to pay off the debt. At this point, you can approach the quest two ways. If you have the inclination and the gold, you can choose to provide Biene with the funds necessary to pay off her debt. At this point, she will give you permission to keep her grandfather's armor should you run across them later. Biene will also mark the location of her ancestor's tomb on your map for you. You must choose this option if you have already found and sold the sword and armor, as neither respawns. The two pieces that Biene wants you to retrieve have a base value of 1037 gold. If you are only interested in the cash, this is a poor choice since your mercantile skill would need to be so high to turn a profit on the deal that you would have long since run out of items, horses, or even houses to actually buy. The armor is not only a unique set, it also has a unique appearance. If you are a collector, or like to decorate your house, you will never have another chance to acquire any items that look like it. You can collect the armor at any time (including before this quest) without stalling the Fighters Guild questline. If you don't have the cash, or are looking for adventure, you can proceed to Amelion's Tomb which Biene has been gracious enough to mark on your map. It's located across the Lower Niben, southeast of Water's Edge. Once you've plundered the tomb and retrieved the sword and cuirass, return to Biene. You are again given the opportunity to give her the money to pay the debt and keep the items. Note that Biene is not interested in any of the other items of Brusef Amelion's Armor that you can find in the tomb. These other items are all unenchanted. Return to Burz gro-Khash in Cheydinhal to receive a standard level-dependent gold reward and a one point Fame increase. If you have already completed Den of Thieves, Burz will also be willing to promote you to the rank of Protector. You will then have to go to Modryn Oreyn in Chorrol for your next quest, The Master's Son. Otherwise, you will need to go to Azzan in Anvil to complete Den of Thieves next. Upon completion of the quest, NPCs can be heard saying: "Sure, the Fighters Guild raided a family tomb, but they did it for a family member. What's wrong with that? ", even if the player decided to pay the debt off themselves. It is considered trespassing to enter Biene Amelion's house during the quest. 10 Burz gro-Khash has given me a contract to retrieve an heirloom for Biene Amelion, who lives in Water's Edge, a small settlement near Leyawiin. I should report to her for further details. 20 Biene Amelion has told me that she wishes for me to retrieve her grandfather's ceremonial sword and cuirass from their family tomb. She is in debt to a local merchant, and she wishes to sell the sword and cuirass to pay off the debt. 25 I have learned where to retrieve the sword and armor for Biene Amelion. 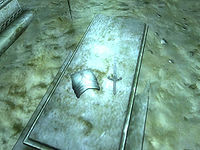 30 I have retrieved the ceremonial sword and armor from the Amelion Tomb. I should return them to Biene Amelion. 50 I have given Biene Amelion her grandfather's ceremonial sword and armor so she may sell it in order to pay off her debt. I should return to gro-Khash in Cheydinhal. 100 Finishes quest I have returned to Burz gro-Khash, who was pleased with my efforts. He has paid me what was owed on the contract. It is possible to use the console to advance through the quest by entering setstage FGC07Heirloom stage, where stage is the number of the stage you wish to complete. It is not possible to un-complete (i.e. go back) quest stages. See SetStage for more information. This page was last modified on 17 August 2012, at 13:55.